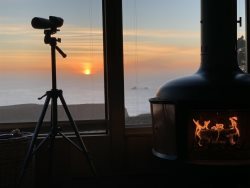 Hummingbird Cottage Jenner Ca, Sonoma Coast ocean and river views, Wine Country, Redwoods, River and Ocean, enjoys privacy and sleeps four. Hummingbird Cottage is a popular, perfect retreat for couples or a small family getaway. Enjoy the sweeping river estuary to ocean views from up on the deck during the day, and stargaze out into the night sky at Hummingbird Cottage. BBQ & Lounge on Deck; Ease into the hot tub on the upper deck. Plenty of rest and relaxation is calling. Activities in the area include wine tasting/tours, swimming, kayaking, hiking, biking, fishing, horseback riding, surfing, golf and much more. "Amazing location with spectacular views of the river and ocean. Much to the delight of my mother there were hummingbirds literally everywhere we looked. The accommodations were comfortable for those of us that don't require a lot of 'luxury' in the places we stay. Overall I would highly recommend this spot for a beautiful secluded getaway!" There is a full flight of stairs up to Hummingbird Cottage entry. small retaining wall of gardens and hot tub in the back down a full flight of stairs. bedrooms and bath are separated by a hallway. Due to the septic system, parking, neighbors and location this property can only accommodate the number of persons the house can sleep.